Project Report: Pass Pomme Church Complete! After many delays the new church building in Pass Pomme will be ready for the dedication service soon. The roof is on! The church benches have been delivered! The school classrooms are complete! And the new mezzanine is almost finished! One unique aspect of the Pass Pomme church is the beauty of the mountains and the surrounding landscape. Because of this, we decided to build a mezzanine on the top of the school classroom so that everyone can take in the wonder of God’s creation. As you can see from the pictures our good friend, Theo Prophete, had the idea to use a welded metal lattice structure over the top of the mezzanine. Theo is both the architect and the project manager and designed all three aspects of the project: the new church building, school remodel, and creative new mezzanine. The idea behind building the metal lattice work, instead of a traditional roof, was to reduce the cost and the weight of a shaded structure over the mezzanine. Because the topical climate is great for growing plants and vines Theo had the idea to plant vines that will grow in through the lattice work over the mezzanine - literally letting God provide the shade! This beautiful mezzanine will be a wonderful place for weddings and a great educational space for the kids. It will also be a thrilling retreat space encouraging visitors to connect with God and pray; while getting to experience the awesome mountain views. 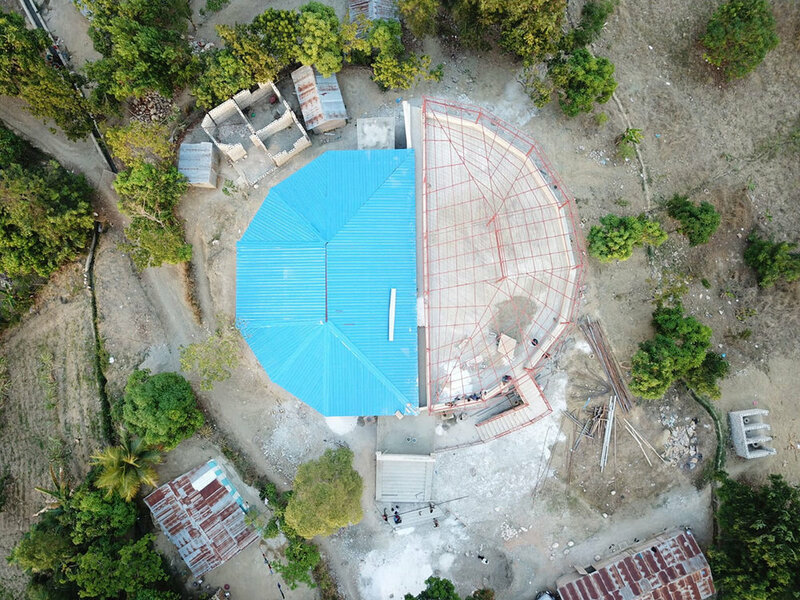 Read more about the progress on this project from our previous stories: The Foundation & A Well and The Patient Pastor's New Church. We are looking forward to the new church dedication service soon. A huge thank you to everyone who joined us in making this project happen. Please continue praying for the church in Pass Pomme. To donate for the first time or increase your support visit HopeRisingHaiti.org/donate or click below. "... serve one another in love."